When you for the first time visit the Vindel Mountains by horse you’ll discover what unbeatable pathfinders our Icelandic horses are. They make your way through the birch forest’s curved branches and up on the bare mountain where the crowberry shrubs and mountain willow spread. A bit higher up are the vast mountain moors, which in July reach floral splendour. The horses follow the winding reindeer trails sometimes almost climbing over steep rocky areas. They carry you across rippling and now and then rapid mountain streams. Most of our horses are born in Iceland and carefully picked to be convenient in our mountain terrain. We want steady and compact horses that manage walking a full day in an even work pace. The Icelandic horse farmers would call our horses “tough” and then in a positive way. A “tough” horse has a strong and stable mind, makes its way without hesitation and is easy to handle. By means of the Laplandish nature, the Sámi culture and our Icelandic horses Fjällhästen offers you the ingredients to create your particular mountain experience in roadless lands. A week’s riding tour out of the ordinary. During six days we travel about twelve Swedish miles across untouched mountains with the Icelandic horse as companion. Accommodation in mountain hut and cots with open fire. The food is partly prepared with the primary products that the mountain countryside produces: reindeer, elk and mountain fish. 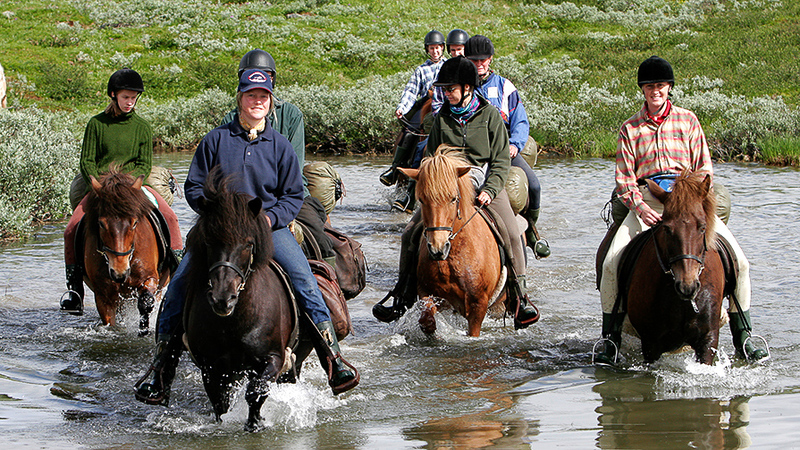 Three days on the mountain on Icelandic horse. Six Swedish miles of riding in the unique landscape of the Vindel Mountains. Accommodation in mountain hut and cot with open fire. The food is mostly prepared with locally produced primary products with ingredients of game meat. Come along with Fjällhästen on a two day’s riding tour into the Nature Reserve of the Vindel Mountains. We spend two nights in Fjällhästen’s comfortable Sámi long cot by lake Tjaskal with dinners mostly prepared with local primary products. During the second day we ride up above the tree limit along the elongated mountain Stuore Jåppe to the mountain lake Raksjaure where we have a stop for coffee and then return to Tjaskal. A riding tour with lots of mountain adventure for experienced as well as less experienced riders. Meet the autumn mountain with its colour splendour and snow-covered peaks from the back of the Icelandic horse. During the end of September and the beginning of October we ride for day excursions in the Ammarnäs surroundings. Accommodation at Fjällhästen’s hostel. Experience Ammarnäs and its nearest mountain area from horseback. Two different day excursions, a four- and three hours tour respectively are on this year’s programme. The riding is primarily a landscape experience where you as a participant should have some riding experience.